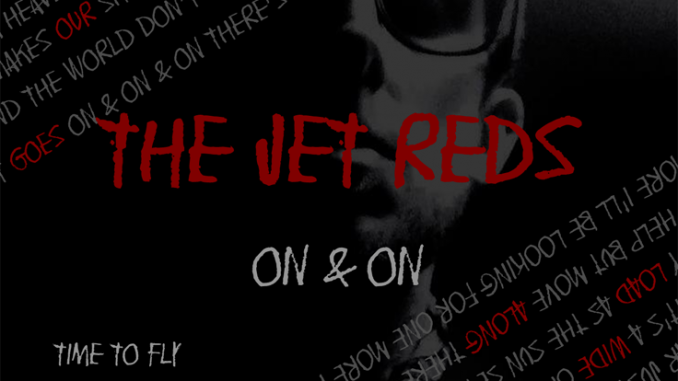 The Jet Reds, an exciting four piece from Newcastle, deliver their own unique brand of independent rock whilst drawing influences from the likes of Kasabian, The Jam, Oasis and other great luminaries from the alternative rock scene. New double A side single shows the diversity in The Jet Red’s sound. ‘On and On’ is an uptempo guitar driven slice of indie rock whilst ‘Time to Fly’ featuring the late Diane Charlemagne (Moby, Urban Cookie Collective, Goldie), is a beautiful, soulful track, and one of the last recordings that Diane would make before her death in October 2015. Craig Redpath, the principle writer and leader of the band had a chance meeting with noted producer Mike Bennett (The Fall, Ian Brown, The Specials, Kim Fowley & The Sweet) culminating in the recording of the band’s first album, featuring guest appearances from artists such as Diane Charlemagne as well as members of Elbow, The Fall and Snow Patrol. The tracks have caused a ripple of excitement within the indie industry with artists such as Neville Staple (The Specials and Fun Boy 3) pledging to guest on one of The Jet Red’s upcoming releases with his inimitable and legendary toasting style. The band are set to play Polyfest in London on April 30th, joining a bill filled with established acts such as Roddy Radiation (The Specials), Saffron Sprakling (Republica) and Doctor & The Medics. The Jet Reds have enjoyed extensive support from BBC Introducing DJ Nick Roberts, who has aired the band several times. They have also supported both Kasabian and Noel Gallaghers High Flying Birds.